Following more than 8,000 visits to Katena in October we're thrilled to be welcoming our favourite Nottingham-based internationally renowned company Architects of Air back to Wheee! 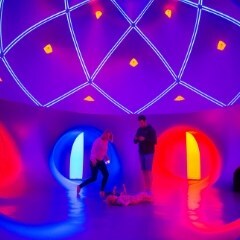 with the UK premier of a brand new luminarium. Still at the design stage this luminarium doesn't yet have a title, but we already know that it will be a wonderfully imaginative labyrinthine and dome-like structure of irridescent colour and light. It's sensory, it's magical and it is truly for everyone.